9 janvier 2008 : Le comité de préfiguration de la Haute Autorité sur les OGM rend son avis sur le MON 810 : doutes sérieux. 24 mars - 8 mai 2007 : "Mois international d'opposition collective aux OGM" (JIGMOM). 18 mars 2007 : Une étude prouve le danger d'un OGM autorisé par les instances de régulation, sur la base des expériences de l'entreprise. 30 octobre 2006 : Analyse de diverses contaminations de riz. 21 juin 2006 : La Commission européenne publie un sondage sur la perception de la science et en particulier des OGM par les européens. 23 november 2005. 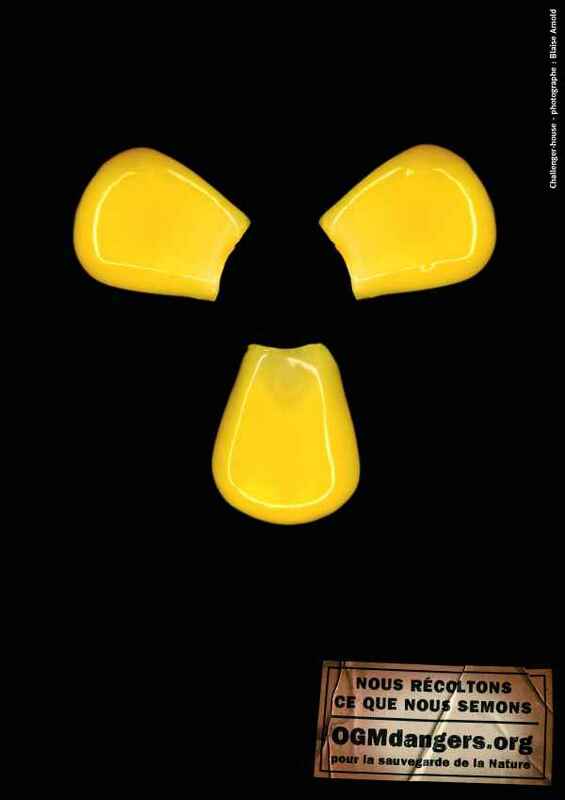 Les suisses votent pour un moratoire sur les OGM. 19 november 2005. An australian study to prove innocuity of a GM pea indeed proves risks. The whole validation process is stoped. 15 october 2005. A russian study of a GM soy flour proves a greater alimentary risk on female rate and their. June 18th 2005 : international day of opposition to GMOs. Of course, we will be present and defend our goals. nos objectifs. See the report. May 19th to 23rd, 2005 : We have a stand at the exposition Vivez Nature. May 10th, 2004 The french governement launches a consultation to know what people (who are connected to the internet) htink of GMO trials whose goal is farming at the end. See our press release and the political analysis. OGM dangers coorganises a colloquium « OGM : de la contestation aux alternatives » with the journal L'Ecologiste on june 20th and 21st 2003. Program here. Greenpeace reveals that coexistence of two systems of distribution (GMO versus non-GMO) is impossible according to the european organism of the European Commission. See also our Press release. One may not oppose GMO if one does not oppose also the world that produces them, but also the best world to which they surreptitiously lead us. The goal of the organisation OGM dangers is to fight against GMOs. To that purpose, it highlights the often neglected aspects that loom behind GMOs : economical, political, philosophical, food safety, environmental, agricultural and legal. Our thinking model is radical in its etymological sens (radix, icis= racine), which is definitely not extremist ! We want to go back to the roots of the problems rather than accepting solutions, often harmful, to problems raised by the technics previously sold by scientists whether from the private or the public domain. Our website is not designed for the latest news, but rather in the process of a deep thought on this complex topic. The random quotation from a "pro-GMO". We want to thanks the creator of this image Éric Esculier, the photographer Blaise Arnold and the agencyLeo Burnettthat have conceived this image and offered us to put it on our web site with no fee. Support the amendement 252 that forces the GMO farmers to respect the other cultures (AOC, organic, ...). To promote the prohibition of GMOs in France by the Union nationale de l'Apiculture Française (who recolt honey). No GMO in my city : to give your major and authorities the elements to prohibit both farming and even trials on your city. You may have a list of what some friends do and which is not so separated from the goals of OGM dangers.